I love seeing my photos taking physical forms off of the computer screen, as handheld objects, as keepsakes, as gifts, and as family heirlooms. I have clear memories of sitting with my mom and sisters, flipping through my parents’ wedding album and laughing at the bridesmaids in their puffy-sleeved, big floral print 80’s bridesmaid dresses (sorry Mom). That memory was made because we had that object to gather around and hold in our hands. To help my clients create those keepsakes and those moments, I’ve worked hard to create a small list of select product options that I’ve tested out and have confidence in. 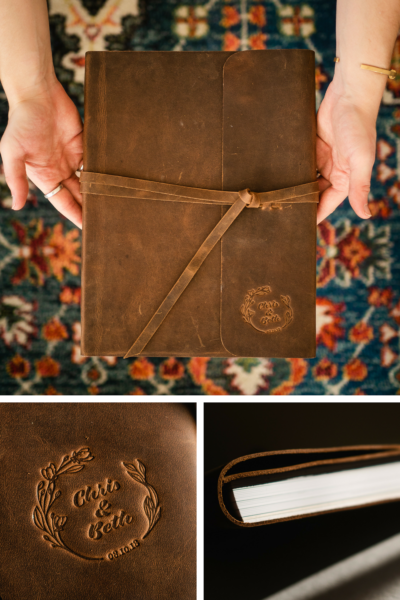 As a storyteller, I’m obviously drawn to books as a medium… albums can be a really elegant home for the story of your day. I’ll guide you through the album design process from start to finish. I pass on the prices of the books at cost from the production company, plus a $250 design fee. The book cost varies based on size, number of spreads, and cover preference, but generally ranges from $250 to $700. I also offer parent or companion albums, which are smaller versions of your main album with a similar design at a lower price point. To begin your album design process, let me know you’re interested and we can start the conversation to begin the draft of your design. You’re able to order professional-quality prints right through the online gallery system in a variety of sizes, from wallets up to 24×36″ prints. After testing a few printing labs and a variety of paper options, I decided to keep it simple and offer my clients one option that I trust. All prints ordered through the system are printed by a professional lab on Kodak e-surface paper, which has a slight sheen and slight texture, but isn’t too glossy or too rough. It’s rated as a 100-year home display archival paper (with a 200-year rating in dark storage), which means that your framed photos won’t fade, and your box of prints will last for even a few more generations! Print packages are also available through the gallery system, which are discounted bundles of prints that are frequently ordered together. 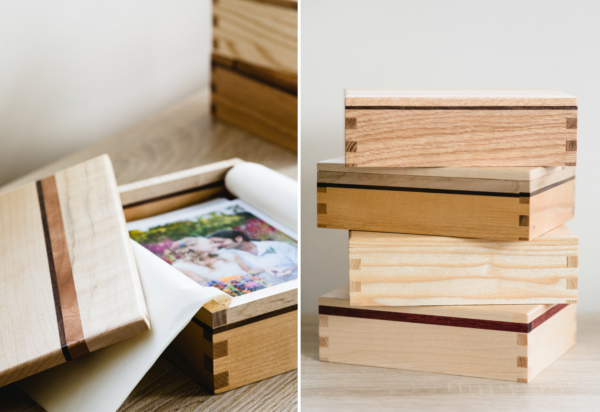 I’ve teamed up with local woodworker Greg Armstrong to offer locally-crafted wooden boxes filled with memories from your day. One of my favorite things to do with a set of printed images is lay them out and reorganize them… being able to reshuffle the narrative is a fun way to see the complexities and details of your story in a new way, with new juxtapositions. You pick 50 of your favorite photos to include in the box, which will be delivered as 4×6″ archival prints. Every box is unique, made locally from a combination of oak, maple, and other hardwoods for trim. Boxes have the depth to hold up to 150 prints, so feel free to order additional prints to add to your collection. The boxed set containing 50 prints costs $129 and can be ordered directly through the online gallery system. In my quest to keep business local, I’ve teamed up with The Frame Shop, where my clients can receive a 20% discount on all custom framing. You can order prints in sizes up to 24×36″ through the online gallery system, and then take your images directly to Emily and her team, who can work with you to pick out a frame that works for you and your style!